Invite Card for “It’s All About the Story, Volume 3: Lee Smith. Each February we team up with one of the many noted authors who prompted the Wall Street Journal to name Hillsborough, NC as “America’s Little Literary Town”, and do a show of art inspired by that author’s work. This year we responded to Lee Smith’s collection of short stories, Mrs Darcy and the Blue Eyed Stranger. These interpretations take form in every media present in the gallery from painting and sculpture, to pottery, glass and jewelry. 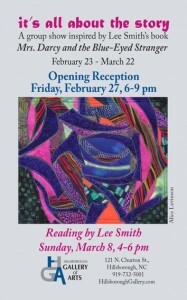 The opening reception for this show is this Friday, 6-9pm. 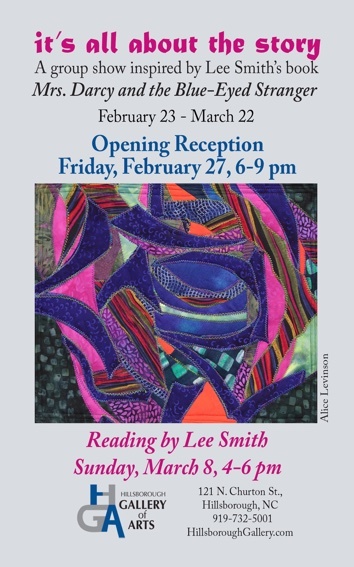 The Gallery will also host a reading by Lee on Sunday, March 8th from 4-6pm. Be sure to stop in and see this yearly melding of visual and literary art. This entry was posted in Art Shows and tagged Art show, Hillsborough Gallery, Lee Smith, opening reception, the Hillsborough Gallery of Arts on February 22, 2015 by lynnadmin. I can’t wait until I see your wonderful work.